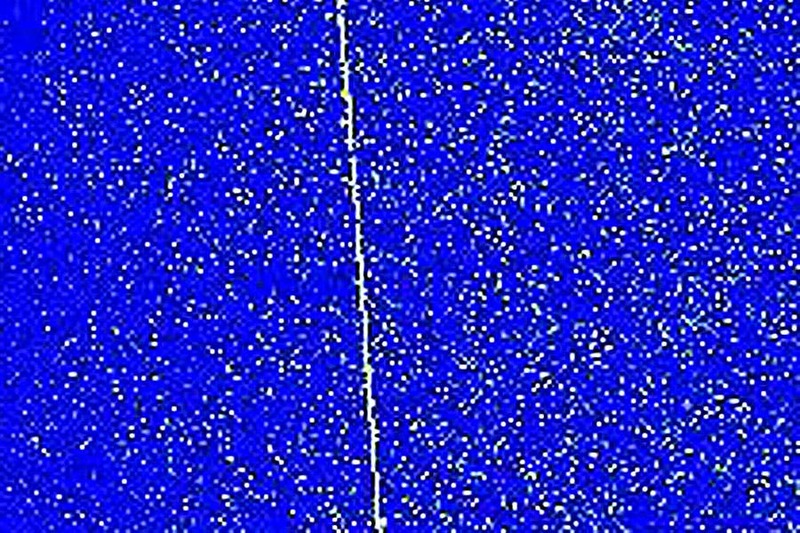 From the ‘X Files’ Dept: What Caused this Signal? Advanced ET Life or Earth-Based Source? No one at SETI headquarters knows for sure. The believe that there is a slight possibility that it just might originate from an extraterrestrial intelligence. The bright colors on the blue background indicate that an anomalous signal was received here on Earth by a radio telescope involved in a Search for Extraterrestrial Intelligence (SETI). Time labels the vertical axis of the above plot, and frequency marks the horizontal axis. Although this strong signal was never positively identified, astronomers have identified in it many attributes characteristic of a more mundane and ultimately terrestrial origin. In this case, a leading possibility is that the signal originates from an unusual modulation between a GPS satellite and an unidentified Earth-based source. Although many unusual signals from space go unidentified, no o signal has yet been strong enough or run long enough to be definitively identified as originating from an extraterrestrial intelligence.